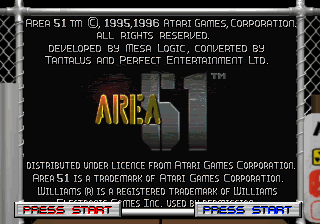 Area 51 (エリア５１) is a 1995 arcade light-gun game developed by Mesa Logic and released by Atari Games. It was ported to the Sega Saturn in late 1996 by Tantalus Interactive and Perfect Entertainment and published by Midway, alongside versions for PlayStation and Windows PCs. Area 51 was followed by Maximum Force, produced by the same team at Mesa Logic, but with an entirely different setting. Area 51 is an arcade, on-the-rails shoot-'em-up built around light guns. The graphics are pre-rendered, using human actors (similar to Mortal Kombat) for soldiers, and full motion video so simulate moving through the world. The Saturn version of Area 51 is relatively close to its arcade counterpart, but chooses to present itself with an added border - a feature that remains through the entire experience and is absent from other versions. The resulting smaller field of view means that all 2D graphics and full motion video clips are rendered at a lower resolution than their arcade (and PlayStation) counterparts. The nature of disc-based media means transitions between scenes have a slight delay as the game loads in new data. This is particularly noticeable in the attract sequence. Like Virtua Cop, Tiger also produced a handheld version of Area 51 as a part of their Laser Games series of minature lightgun games. The folding gun included with this version is reliant on infra-red technology. Main article: Area 51/Magazine articles. Main article: Area 51/Promotional material.